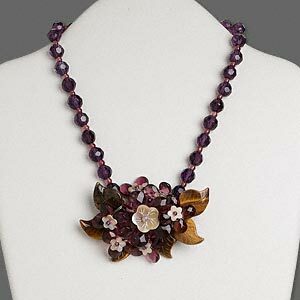 This necklace is amethyst color with tigereye and mother-of-pearl shell (dyed) and glass purple beads and glass brown leaves. It is very pretty. It is 16" with a 3" silver-plated brass extender chain and a lobster-claw clasp. Unique to say the least.